Spring is here! It’s 70-something in Pittsburgh today and appears for the moment that the long, hard, polar vortex extravaganza of winter is over. Having grown up in the fickle weather patterns of Western PA, I realize that tomorrow could be 40, and that snow is a possibility through early May. For now though, I’ll take a beautiful day whenever I can get one. 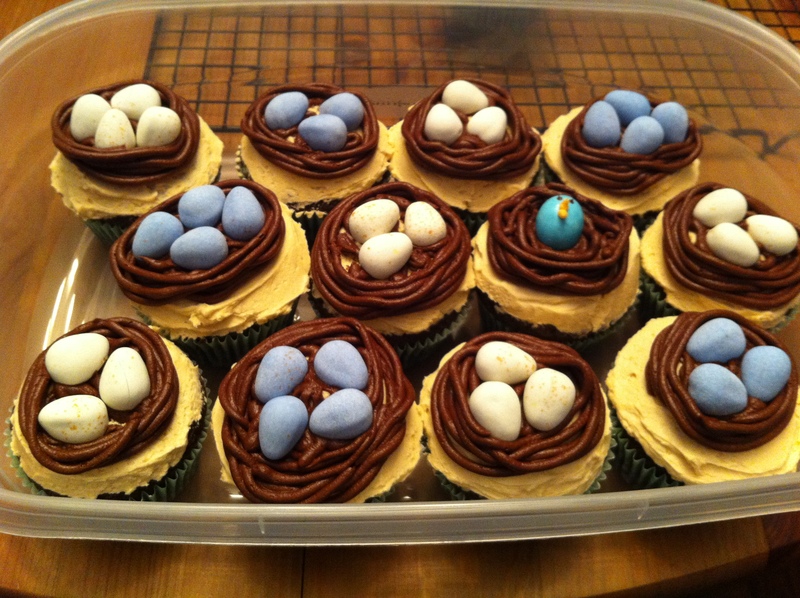 These bird’s nest cupcakes would be great for any spring-related event; an Easter dinner, Mother’s Day brunch, or in this case, a bird-themed baby shower. One of my colleagues hosted just such an event today and I was happy to provide these, which may look complicated but are actually very easy to prepare especially given the abundance of egg-shaped candies right now. 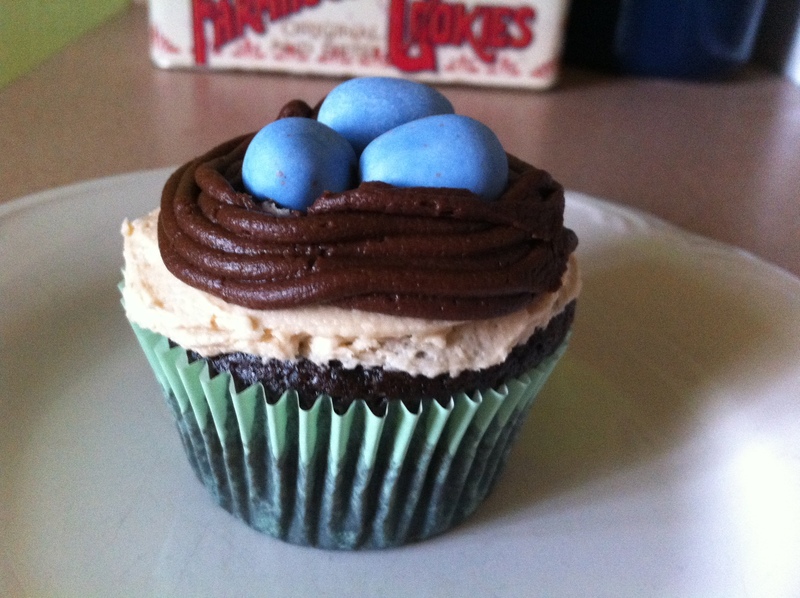 If you can’t find egg-shaped candies for the nests, I suspect that peanut M&Ms would work well too. Prepare vanilla almond buttercream. Using a one-inch cookie scoop, scoop frosting onto each cupcake and spread with an offset spatula in an even layer. Prepare cocoa frosting. Fit a piping bag with a medium plain tip, such as Wilton #5. Pipe nests, creating the outer edges first and filling in with a few squiggles of frosting for the nest bottoms. Place mini egg candies in each nest; most will fit three eggs, but a few of mine fit four. Store in an airtight container at room temperature for up to two days. Note: one of the cupcakes in this batch featured a hatched baby bird, similar to a cupcake I’d seen in the Martha Stewart Cupcakes book, as the cupcake for the mom-to-be. To create this, I used one blue Hershey’s candy-coated egg, melted a few chocolate chips, and dabbed the chocolate on for eyes, then made a batch of Zella’s icing, tinted it orange, and piped on a small beak using the smallest plain tip I have. You can see the hatched bird in the photo below, and you can reserve the batch of icing from the beak for another time; it refrigerates very well.